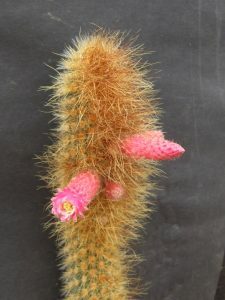 “Closed head cactus”, defining the almost closed, tubular flowers, and the pseudocephalium, the two main features of this genus. Monospecific genus of columnar shrubby plants, branching from the base, low ribs with a V-shaped groove; spines finely setose . Flowers diurnal, self sterile, tubular, red, appearing in a lateral pseudocephalium with long bristles, probably pollinated by hummingbirds. Fruits reddish. Seeds shiny, black. The monotypic genus Cephalocleistocactus grows endemically in a limited area in Bolivia at about 2000 m in altitude.